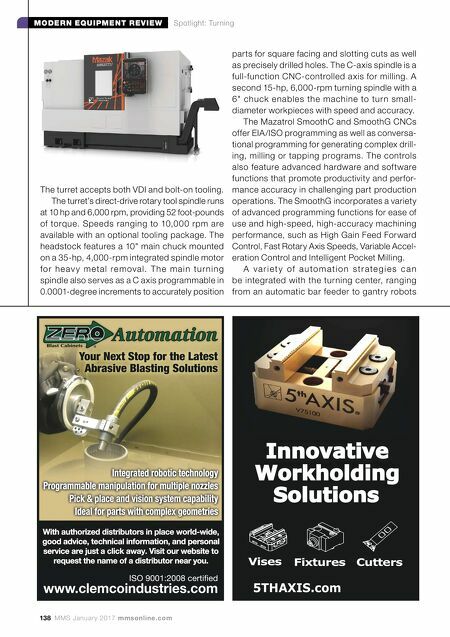 mmsonline.com January 2017 MMS 139 MODERN EQUIPMENT REVIEW Spotlight: Turning for improve d spindle u tiliz ation a nd a boost in productivity. Mazak Corp., call 859-342-1700 or visit mazakusa.com. 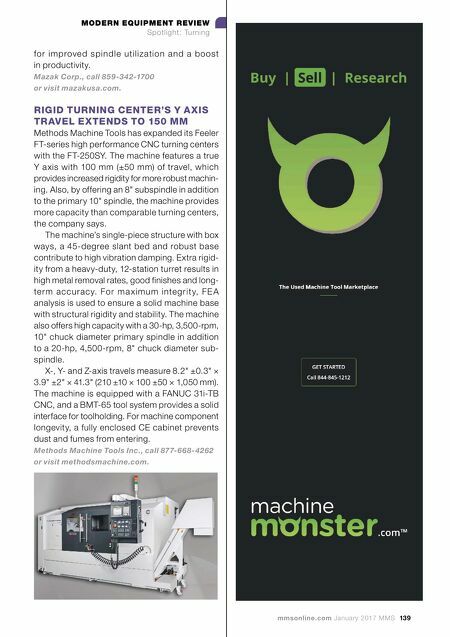 RIGID TURNING CENTER'S Y A XIS TRAVEL EXTENDS TO 150 MM Methods Machine Tools has expanded its Feeler FT-series high performance CNC turning centers with the FT-250SY. The machine features a true Y a xis with 100 mm (±50 mm) of travel, which provides increased rigidity for more robust machin- ing. Also, by offering an 8" subspindle in addition to the primary 10" spindle, the machine provides more capacity than comparable turning centers, the company says. The machine's single-piece structure with box ways, a 45-degree slant bed and robust base contribute to high vibration damping. Extra rigid- ity from a heavy-duty, 12-station turret results in high metal removal rates, good finishes and long- te r m ac cu racy. Fo r m a x imu m inte g r i t y, FE A analysis is used to ensure a solid machine base with structural rigidity and stability. The machine also offers high capacity with a 30-hp, 3,500-rpm, 10" chuck diameter primary spindle in addition to a 20-hp, 4,500-rpm, 8" chuck diameter sub- spindle. X-, Y- and Z-axis travels measure 8.2" ±0.3" × 3.9" ±2" × 41.3" (210 ±10 × 100 ±50 × 1,050 mm). The machine is equipped with a FANUC 31i-TB CNC, and a BMT-65 tool system provides a solid interface for toolholding. For machine component longevity, a fully enclosed CE cabinet prevents dust and fumes from entering. Methods Machine Tools Inc., call 877-668-4262 or visit methodsmachine.com.